Planning to spend your vacation in a beautiful paradise island? Feel free to check out Perhentian Trans Holiday 2-way ferry ticket between Kuala Besut Jetty and Perhentian Island today! Perhentian Trans Holiday now offers online booking for its 2-way ferry service between Kuala Besut Jetty and Perhentian Island at BusOnlineTicket.com. 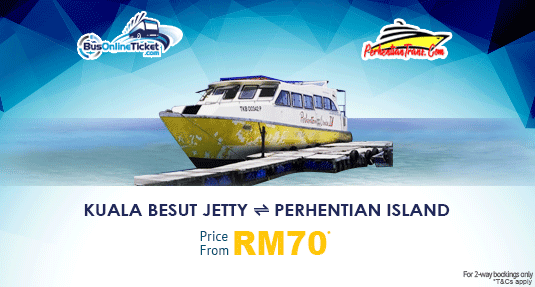 The 2-way ferry ticket price between Kuala Besut and Perhentian Island is only from RM 70.00. Please note that the Perhentian Trans Holiday ferry ticket between Kuala Besut Jetty and Perhentian Island is only applicable for 2-way ferry ticket booking via BusOnlineTicket.com. Perhentian Trans Holiday ferry tickets are available for online booking at our site. Book your ferry from from Kuala Besut Jetty to Perhentian Island and from Perhentian Island to Kuala Besut Jetty via BusOnlineTicket.com and travel with Perhentian Trans Holiday. Instant booking confirmation sent to your email once the payment is confirmed!